Lazarus Chakwera waves MCP supporters a 'hi-5' in Nkhotakota. "They promised to end corruption, but you can see that corruption has reached alarming levels. They have failed," said Chakwera. Chakwera described manifestos as "a party's contract with the electorate". 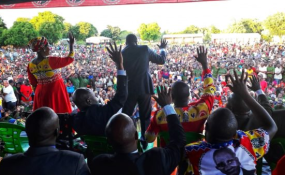 "Malawi Congress Party is the only hope of Malawians because the current administration has failed to deliver on their promises made in 2014, such as infrastructure, road system, farming, schools as well as health system" he said. During the Nkhotakota rally, Chakwera again grabbed the red card, which leads to a player's ejection from the fmatch, and waved it, saying he was showing it to Mutharika and DPP. "I am flashing a red card that it is time for Mutharika to pack up and go," said Chakwera. Previous: Malawi: Dare To Record Videos of Mutharika’s Speeches?